Last night I was feeling particularly inspired (for me, that is), and so I cooked up a tasty little series of vegetables and tofu. 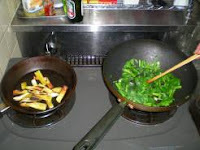 All the vegetables and the tofu were done on our little fish grill, and the greens I did in the wok. Our kitchen comes with a two burner gas stovetop that has a little fish grill in it. 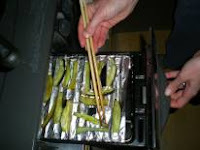 It's sort of a rack you pull out and then lay whatever it is you hope to cook down, close the door, and grill away. Influenced by a neighbor who did her asparagus in it, I thought I'd give it a shot with a some of the stuff we picked up recently. All of it turned out really well, although the tofu wasn't as firm as I would have liked. Even the firmest we've been able to find here is still quite soft, but we'll adapt. The sweet potatoes could have been a wee bit softer, but they were still quite tasty and the eggplant was perfect. We served it up with a little bit of wasabi on the side and a glass of cheap red wine. Yum!